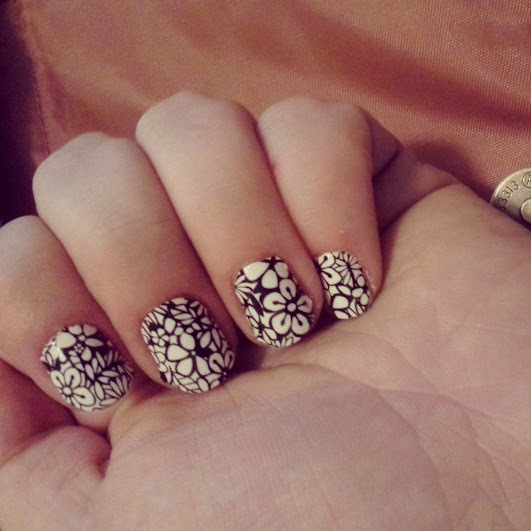 But I’m home now, and I just finished doing my nails. Which apparently took two hours. I’m a perfectionist. No, I didn’t paint the pattern. I’m not *that* obsessive. They’re appliques. I’m desperately poor, but I have fantastic nails. 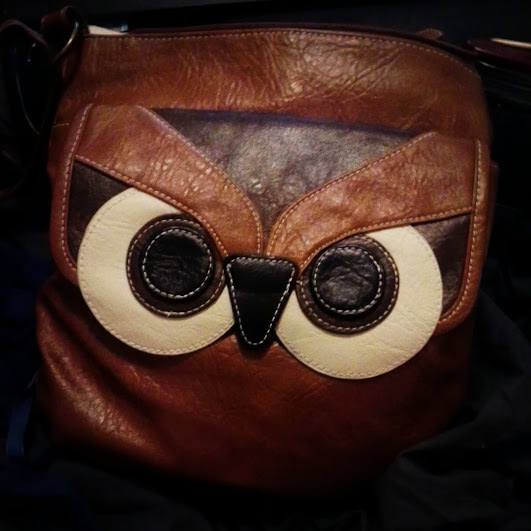 I also bought a purse yesterday, because it was on sale, and because it makes me happy. HOW COULD I NOT OWN THIS PURSE? I need to take my pleasures wherever I can find them, because I have been wicked hella depressed, yo. I haven’t found work. I’m trying to find work. I have some interesting prospects. I know that I could be an asset to the right business. I want to work, and I’m willing to work hard. But no one will hire me, and I’m at loose ends and barely scraping by financially. My boyfriend has been living here and helping me pay rent, but lately he seems angry a lot of the time and he’s starting to spook me a bit. I feel trapped with this angry person, but I honestly can’t afford to kick him out, and I don’t want to just leave him homeless, either. It seems like there’s no good solution except to get a job and become financially independent– and I’m trying but no one will hire me and also MEH. Something I haven’t really talked about here is my new living situation. In May, I moved back in with Delilah. I have a bedroom this time, not just the stuffy garage. But my rent is about 60% of my monthly unemployment income, and I always run out of food stamps long before the end of the month. I moved because my formerly supportive and encouraging roommates turned on me suddenly. My brother and his wife very quickly changed from being happy and seeming to love having me around to believing that I’m a selfish taker who takes and only thinks of herself. Or something. Although she wrote me about 70 paragraphs of vitriol and accusations, I’m still not entirely sure what the hell happened. But it was clear that I had to move, and so I did. Losing her as a friend has been both devastating and, in an odd way, affirming. Because I realized quickly that there wasn’t much of anything I could do to change the way she feels, because she was being crazy, and reason doesn’t work on crazy people. I have my own theories about what made her change her attitude toward me so suddenly and sharply, but the most important thing I know is that I can’t fix this right now. And there’s a lot of peace in that. I’m incredibly sad about losing my good relationship with my brother and his wife, but at the same time, I’ve suffered worse. I can live with this. I haven’t been able to find an even keel for months, though, ever since the family crisis started. There’s a melancholy fog over everything that I just can’t shake. There’s less joie in my vivre. There’s something particularly scarring about someone who you’ve trusted with the most delicate parts of yourself abruptly deciding you’re a terrible person and using what they know against you. Even if you know they’re wrong, it’s still horrible. My spirits are pretty good, considering all that. Taking into account that I’m in daily pain because my back still hasn’t healed from a car accident 20 months ago. Taking into account that I’ve got a sadness I just can’t seem to shake. Considering that my relationship is starting to seem abusive. In spite of the fact that I’m running out of unemployment and I don’t know how I’m going to make ends meet in a month. All things considered, I’m doing just fine.